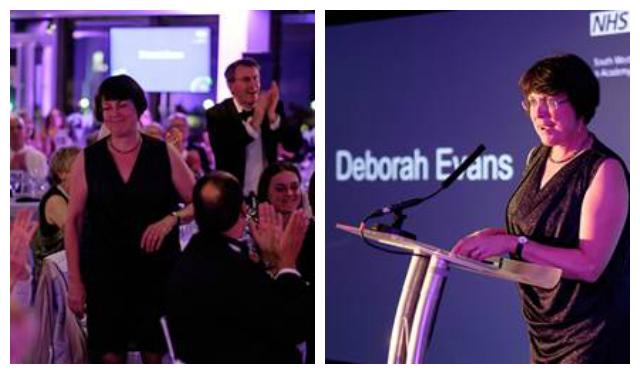 Congratulations to our Managing Director Deborah Evans who has received a prestigious leadership award. The NHS South West Leadership Recognition Awards 2016 took place on Friday 11 November at the Bristol Pavilion. It was an inspirational and hugely emotive evening hosted by Christina Quinn, Director NHS South West Leadership Academy and Ann James, Chair NHS South West Leadership Academy, with a very special guest speaker Tommy Whitelaw; a full-time carer for his late mum, Joan, who had vascular dementia and who now works on The Dementia Carers Voices project with the Health and Social Care Alliance. The awards featured so many inspirational people, special nominees and their colleagues – all there to be recognised for their fantastic achievements and a commitment to patients, service users and true health and social care values. Deborah Evans was presented the Leading Systems Transformation award, announced by Rob Sheffield, Director of Bluegreen Learning. The Leading Systems Transformation award recognises an individual or team who has demonstrated essential qualities of leading change across systems and demonstrating effective systems leadership skills. Watch this short video for Deborah’s response to being nominated for the award, which recognises the support of colleagues across the region. For more information and to see the full list of winners, visit the NHS South West Leadership Academy website.